Beautiful hair in the morning, frizzy hair by noon. It's a very common hair problem, and a not so easy one to manage. Sound familiar? Thick, coarse, wavy, and curly hair all have a tendency to frizz, particularly in the summer months when humidity is at it's highest. There's no cure for frizzy hair but here are some remedies to help you control it and calm the fuzz! A good haircut is the best tactic to prevent frizzy hair and you can ask your stylist to use thinning scissors to thin your hair if it is too coarse or thick. This should make it much more manageable and tame it down. Thinning scissors are easy to use and available in stores also, but you need to know how to use them. Sometimes just having it done once at a salon is educational. Watch how they use them and follow the lead next time if you can't afford to go there every time. We all know by now that using a conditioner is necessary to control frizzy hair. The trick is to leave the conditioner on for a few minutes before rinsing it out. If you have extra time, try wrapping your hair in a towel with the conditioner on and let your hair soak for about 10-15 minutes. Then rinse it out. When you're done, wrap your hair in a towel for several minutes to get out the access water instead of rubbing the towel over your head. Both towel rubbing and brushes lead to hair breakage and make it much more vulnerable to the frizzies. Try just putting on some mousse or spray-in conditioner and comb it in. Let air dry and don't run your fingers or a comb through it until it's completely dry. Using a blow dryer in hot weather will probably make the problem worse. If you want your hair straight and that's the only way you can get it that way, then by all means, use the dryer. Just use the cool setting and don't use it every day. 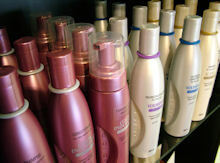 Many shampoos and conditioners are good. However, not all big-name brands are better, they just carry a larger price tag. It's a good idea to use multiple brands. This helps to avoid build-up that will make your hair appear heavy and dull. Don't wash your hair every day. Your natural oils help tame it down. Another way to control frizzy hair is using one of the frizz control remedies that are available in department and drugstores. They are not a shampoo or conditioner but are designed especially for frizzy hair. These serums come in small bottles, but a little goes a long way. Try using one over a thin coat of mousse. As a result, your hair will be more shiny and less frizzy. If you wash your hair in the mornings, you're not going to have time for all of this and you will have to skip leaving it in the towel. Just follow the other steps or consider doing this in the afternoon so that it's dry before you go to bed. Leave-in conditioners that you can spray on will often help dry and damaged hair. You may need to reapply it later on in the day. What works for one person does not necessarily work for the next because everyone has different lifestyles and climates. It's all trial and error. If, in spite of all your efforts, your hair is still frizzy, have hair accessories on hand to pull it back for a quick fix. Finally, various hot oil treatments for dry and damaged hair can give you some temporary control to frizzy hair, but you'll probably need to use them weekly or biweekly.